Spread in 12 Acres, 19 blocks of 11 and 21 floors with approximately 1600 flats and about 60 percent open space. Patna real estate has no residential project so OCEANIC like Aqua City launched by Saakaar Construction on Saraari Gumti and Usri road in Danapur, near ISM Business Management College. The size and amenities in it qualifies Aqua City for an integrated mini township. THE FIRST IN BIHAR. Till now residential projects like KASHYAP GREEN CITY , JALALPUR CITY, JALALPUR HEIGHTS were a few names known to Patnaites as large projects of around 500 units and spread in few acres. AQUA CITY is WHALE like in front of these fishes. Sudip Kumar, Managing Director of Saakaar Construction, and his team have embarked on a challenging path. If they succeed to complete the project in time, it will take Patna Real Estate to a new phase of growth. Sudip kumar and team as a track record of 22 years since 1996 in Patna real estate. Saakaar Orchid Greens and Saakaar Gulmohar Greens are feathers in their cap already and many other projects in Patna. 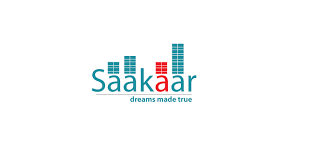 All in all in last 22 years Saakaar has delivered 4.5 Lakhs sq ft of total saleable area. Aqua city is 13.85 Lakhs sq.ft. almost 3 times what Saakaar has delivered in 22 years. The timeline for completion of Aqua City is SIX years. Reach Saguna MOR on Bailey road. Move towards Khagaul (Danapur) Railway Station. About 250 mts before Danapur Railway station take right turn for Lakhmi Bigha. The turn is opposite to DRM office. Travel about 2 kms, cross Lakhmi Bigha village and a Gas Godown and you will reach a T point. On left of T point is ISM BUSINESS SCHOOL. Take right at T point and travel about 1 km towards USRI. On the right hand side you will find AQUA CITY. On this route, from DRM office to the project site there are numbers of sign-boards to guide you reach the destination. This is simplest route to AQUA CITY if one is coming from Patna on Bailey Road. Another approach is from Shivala, from Shivala Chowk move about 2 kms to Usri on Shivala- Danapur road via Hindustan Press factory; take a right turn at USRI towards Sarari and 500 mts to your left is AQUA CITY project. One can enter the Sarari-Usri road from the side of Danapur Station- Shivala Road too. Here you will cross Sarari Village and ISM BUISNESS SCHOOL and then reach the site. As the location description suggests AQUA CITY is very near to Saguna Mor, Danapur Railway Station, Shivala Mor and Danapur Cantt. It also means that it is situated in midst of development happening in western Patna in form of Schools, Colleges, Hospitals, Malls and number of other infrastructural set ups coming up. By the time AQUA CITY is complete in next six years the neighboring area will boast of many more landmarks. Amenities which define modern lifestyle and living décor Aqua City to full. The facilities are well crafted into aspects like sports, entertainment, eating joints, health and education plus day to day groceries and other needs like laundry. It is required as more than thousand families will be living in Aqua City. A demanding work-life cycle isn't unheard of nowadays and therefore Aqua City is planned to beat work pressure by selecting thoughtfully designed amenities for all age groups. Aqua City provides spacious building designs that facilitate multilevel vehicle parking and parking space for guests, which many societies particularly in central Patna missed earlier. Availability of space for social and business gatherings, like a Banquet hall and an open air theatre makes socializing easier at Aqua City. Roof Top Lounge and café along with a Food court adds spice to entertaining guests. There is movie theatre too with 50 seats. Life is dull without play. Going for a quick game after work can do wonders to rejuvenate your soul. Aqua City harbours a GYM, a cricket pitch and a lawn tennis court. Additionally it has half Olympic size (82 feet long and 40 feet wide) swimming pool. We at www.buysellrentpatna.in think it should have two swimming pools as per the project size. Additionally indoor games are missing in Aqua City but it provides for a Yoga and meditation centre. It is not only play but education too. Aqua City will nest a play school for kids and coaching and tuition centre for school goers. Many great schools are spread within a km of the mini township. Kids have a play area for themselves, a Tot lot Lawn. Aqua City takes due care of elderly too. It has Doctors OPD for 8 Doctors and Diagnostic centre with physiotherapy, ultra sound, x-ray, and pathology lab. It will host 24 *7 trained paramedical staff, a medical shop and facility of assisted living. To cater to our daily needs the 12 acre project includes space for Bank and ATM, daily needs stores and shops and laundry facility inside the campus. Aqua city is Wi-Fi enabled campus with 4 tier security along with RIFD controlled entry and exit. 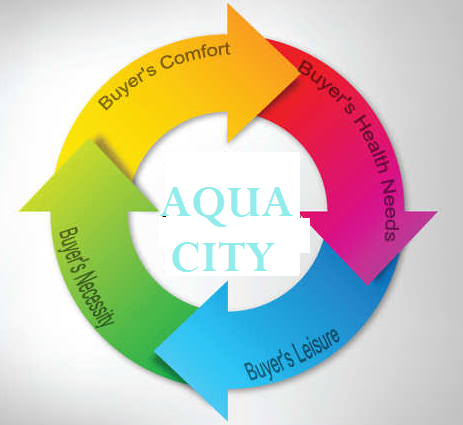 Aqua City endeavours to take care of basics of modern living and designs to suit lifestyles.